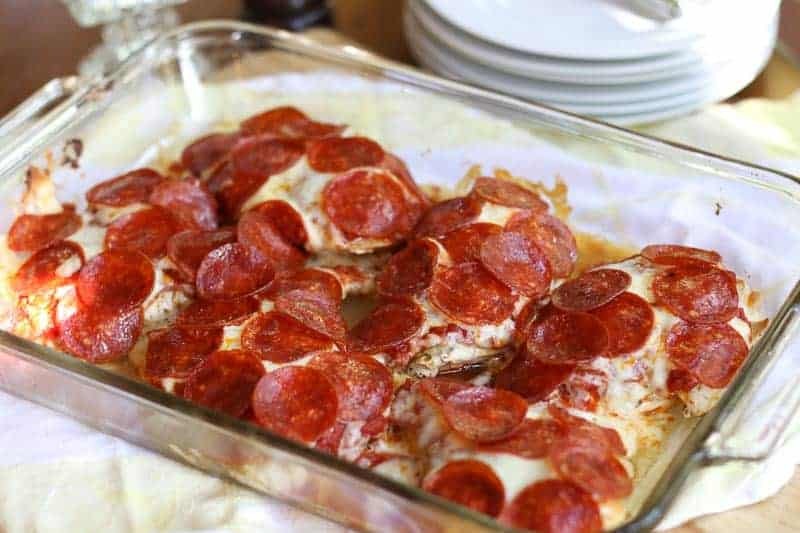 This chicken pan pizza recipe is a tasty, low carb, gluten-free entree perfect for a family meal. Who doesn’t love pizza? 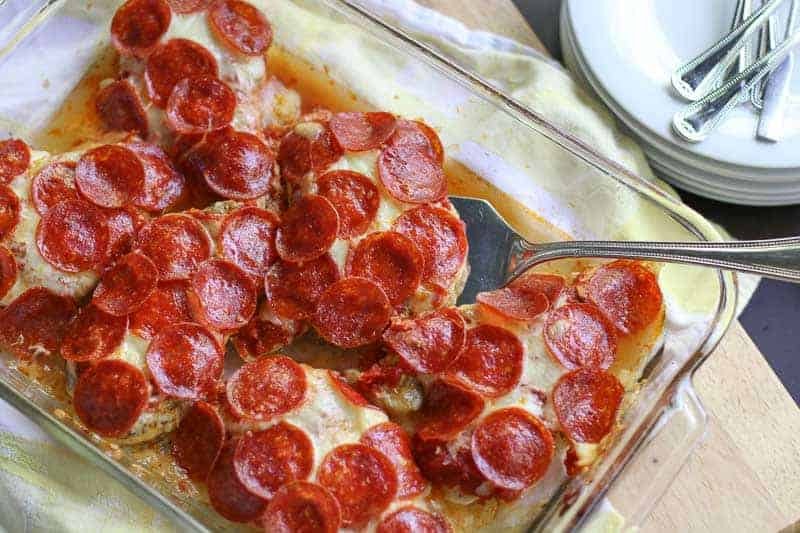 If you love pizza, then you will love this Chicken Pan Pizza Recipe! Even children that are picky food eaters like this dish. This chicken pan pizza recipe requires a little extra step than my usual simple recipes. The extra steps are relatively easy, so don’t let that scare you. You will need to butterfly the chicken breast and then pound them to tenderize them. Then you will pan fry them a minute on each side. The frying helps seal in the juices when you bake them. Otherwise, the chicken dish will become watery and yucky, so DON’T SKIP THIS STEP! I topped the chicken with pizza sauce, cheese, and pepperoni to keep it family friendly. However, if you don’t have picky eaters in the house, you can get creative with the toppings. It would be great to add mushrooms, onions, and bell peppers. Or if you like ham and pineapple pizza, why not add ham and pineapple? My husband loves Meat Eater Pizzas. It sounds a little weird, but I am sure it would be pretty darn good with sausage, hamburger, bacon, and pepperoni… So have fun with it. If you are like this chicken pan pizza recipe and you are looking for a real low carb pizza crust recipe, check out my Low Carb Spinach Pizza Crust Recipe. I LOVE THIS RECIPE. It is much tastier and easier than the “Cauliflower Version” that is popular. I have made this chicken pan pizza recipe for my friends and family and they have loved it. I make several crusts at one time, then put out a bunch of toppings. Then we make individual personalized pizzas. It is so much fun and no one cares that it is low carb. Who doesn't love pizza? 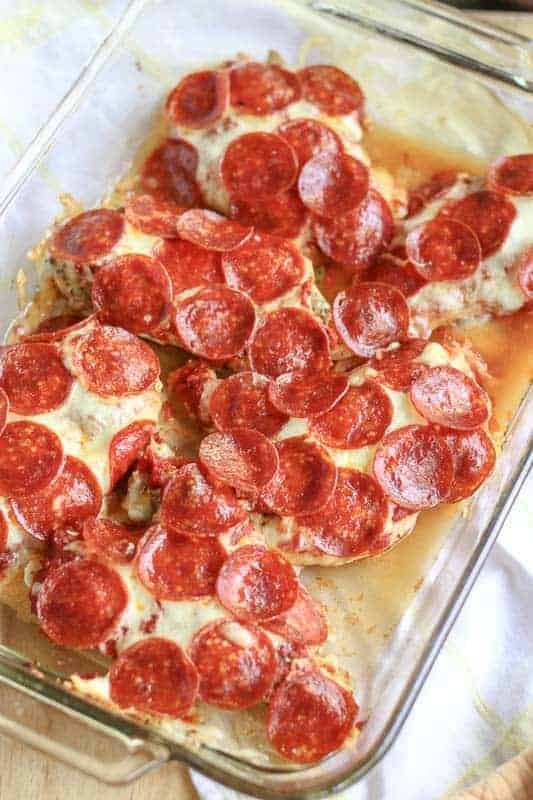 If you love pizza, then you will love this low carb chicken pan pizza recipe! Even kids that are picky food eaters like this dish. Cook pizza sauce in pan on low heat to reduce for about 10 minutes. This will keep the sauce from becoming watery in the pan when you bake it. Meanwhile, butterfly the chicken breasts and cut into 2 pieces. Mix salt, pepper, and oregano together. Sprinkle each breast with seasoning. Cook chicken breasts on each side for one minute, just enough to brown the outsides to lock in their juice. 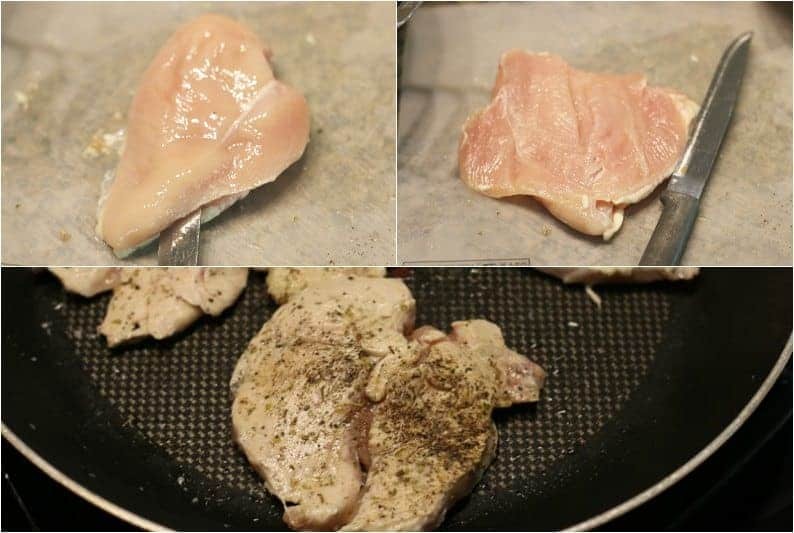 Lay chicken breasts in a 9x13in baking dish. Spread all of the sauce on each of the chicken breasts. Cover the breasts in mozzarella and then pepperoni. This is exactly the kind of recipe that gets me through when I’m on a low carb diet. I will definitely be making pizza chicken in the new year. Thanks for the idea! Wow! My husband would go crazy for this. And low carb too! Love it! I can see it as a good alternative to the gluten intolerant people. Looks tasty! Yum! Love pizza but do hate the carbs. Thanks for sharing this recipe! This looks amazing! my son loves pizza and hates chicken…I wonder if I can get him to eat your recipe because it’s pizza….but it gets the chicken in him!! 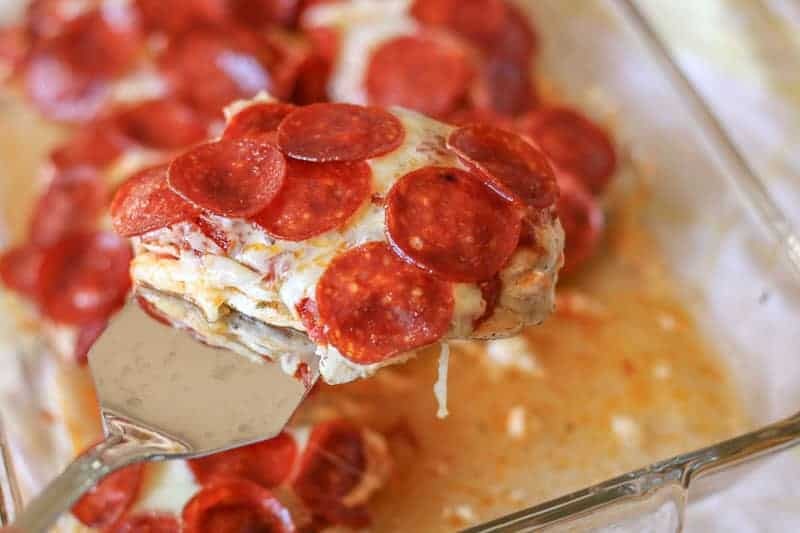 What a great way to do low carb pizza. This would definitely satisfy my craving for pizza without making me feel guilty about all the extra carbs! What a great idea Katie! I love having all the best parts of pizza (the cheese, the pepperoni) as a topping for chicken. Perfect low carb dinner. The great pizza taste without all the carbs. Love it! 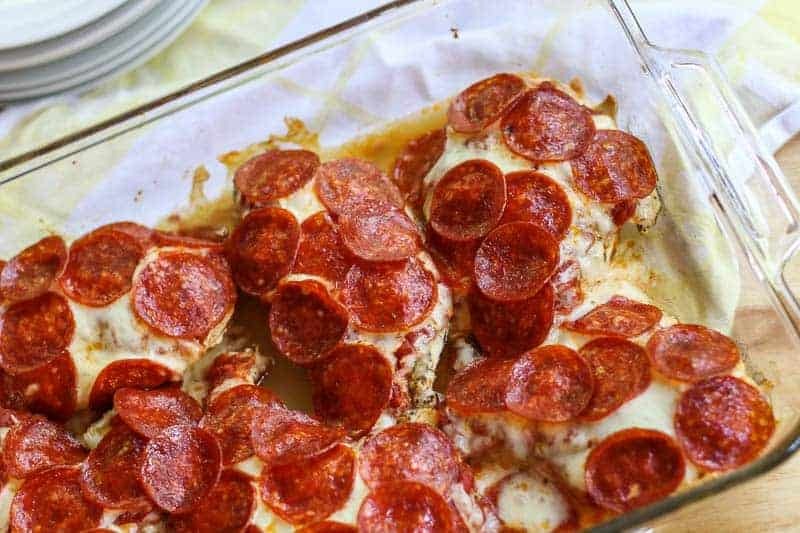 This looks like a great way to bring pizza flavors to a chicken! I also think pizza is a perfect food. Oh yes please!! I would finish the whole pan alone. This food is my kind of secret cryptonite. Flavorful and a filling dish. These look amazing! Will definitely have to try them! i love good GF meals! sounds great! Mmmm. My readers will love this easy and flavor-filled recipe. Thanks for sharing. Pinned!